Jimmy Doyle is an honorable man who took a bullet for his country and returned home to become a private detective. His boss, Lucius Fogg, is the preeminent occultist who dabbles in solving the more macabre crimes of 1950s New York City. As Fogg’s legman, Doyle is thrust deep into the world of the supernatural, pitting him against everything from disembodied spirits to demonic possessions with a few vampires and werewolves thrown in. He often has to face these dangers alone, for even though the enigmatic Fogg is extremely powerful he can’t take one step outside of his home or he will die instantly. The first in a new series of novels from comic book writer Dan Wickline. Do you ever see a book description and think wow, I'd like to check that out and then go to buy it and Amazon says, "Hey, you already bought this ages ago?" No? Just me? Well, shoot. That's exactly what happened with this book. I love a good whodunit and when you in the occult, it just made it all the more fun to read! As a first book in a series, it did a wonderful job of introducing the characters but leaving just enough that you want to read the rest of the series to learn more about them. I need to know more about Lucius and Ariel. So, not only are the characters absolutely smashing, but so is the story itself. It pulled me in and kept me reading right to the end. Well shoot. There wasn't a whole lot that was bad about this book. I caught some grammatical things here and there but really, that was about it. A fantastic read that kept me guessing right up until the end. 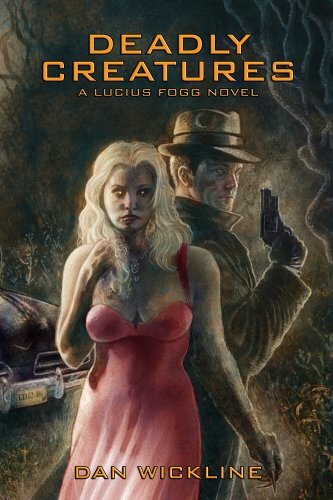 If you're a lover of noir, the occult, supernatural creatures or all of the above, check out Dan Wickline's book. I've already wish listed the other books in the series.